How Smaller Businesses can Compete when Market Leaders Consolidate? In the same month that EMC and Dell discussed the largest tech merger in history, #2 pharmacy Walgreens declared its intent to buy #3 pharmacy Rite Aid, further consolidating another key consumer sector. And of course, this week, AB InBev reached a deal to acquire SABMiller for $107B, resulting in a global conglomerate with approximately $64B in revenues. Each industry is clearly different, yet consolidation like this can have an adverse impact on smaller players. For example, in the case of ABInBev-Miller the operational synergies will likely give the company more cash to spend on a) marketing against the smaller crafts and b) buying up some of the stronger craft brands. In any industry, as the top consolidates, the small players below will need to be wary of the potential impact and think about how they can survive and thrive. Access to the consumer continues to be restricted by larger players: In a focus group at Kinnek last week, several cider makers cited that access to shelf space in stores as well as access to taps at bars was severely limited by the larger, mass-market players. Similarly, larger brewery players have locked up many distribution channels. As consolidation occurs at the top, distributors will have even less leverage to push back resulting in further crowding out of craft breweries. On the pharmacy side, there are fears that further consolidation and the negotiating power that represents, will lead the large players to lock out smaller independent pharmacies by offering more cost effective solutions to employers. Big players limit access to supplies: As larger players consolidate, they can use their market power to a) get better deals with suppliers to pass through to the consumer in the form of lower prices and b) keep out smaller players by eating up most of the supply. For example, aluminum can purchasing has become much more difficult for craft brewers as suppliers have increased lead times and minimum order quantities. 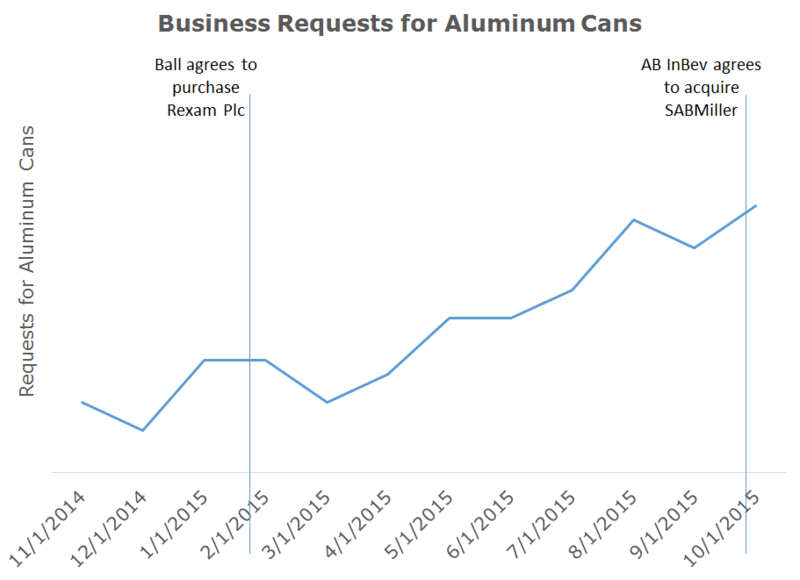 Since the February announcement of the ~$7B merger of Rexam and Ball, which brought together the #1 and #2 can suppliers (and which is already resulting in supply cutoffs for small brewers), Kinnek has seen its requests for aluminum cans more than double [Figure 1]. This consolidation, combined with the ABInBev-Miller merger could further crowd out smaller brewers; as suppliers accede further volume to the leaders with increased market power, SMBs will be forced to seek out other container types or alternate methods of purchase. Collective action: New tools and companies have emerged in the last few years to empower small businesses. As the large corporations continue to fuel their consolidation via debt from large banks, alternative funding companies as well as crowdfunding sources have cropped up as alternate sources to finance the little guy. For example, as consolidation increases in agriculture and food Barnraiser, a crowdfunding platform, is raising money for the little guys from the little guys. Kinnek has also seen a number of purchasers on the platform leverage crowdfunding to at least partially finance their purchases. Advocacy: Small businesses can only survive by using the power of the community to try and effect change at a local and national level. The Brewers Association, for example, is currently advocating to repeal the 3-tier alcohol distribution system that has supported market consolidation in the beer industry. That repeal would allow for easier, more independent distribution of beer and empower craft brewers across the nation. Technological innovations to improve operations: It’s a struggle to optimize a business’ operational footprint, especially if your business isn’t large enough to exploit economies of scale. The good news is technologies and applications continue to simplify and optimize operations management so businesses can focus on their core strengths without the admin. For example, administrative work such as accounting, finance, and HR can all be taken of by apps including Quickbooks, Zendesk, Xero and Justworks while a ton of CRMs enable customer management. Vertical-specific apps are also being built on top of the cloud infrastructure. FarmersWeb is an app that helps small farmers with the distribution of their produce to restaurants and stores. Seamless helped smaller restaurants compete with larger players by providing a simple online interface for ordering and delivery. And Kinnek, of course, provides an online marketplace for small-medium businesses to purchase and a community to help them succeed. Industry consolidation happens all the time. Small-medium players will feel the impact of consolidation at the top however. Smart business owners will anticipate these changes and take advantage of the changing landscape, while others passively watch as everything around them changes. From a Kinnek standpoint we’re glad to be helping the little guys grow.